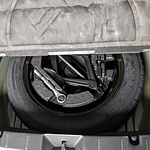 Manufacturers equip their vehicles with spare tires that provide an immediate replacement for a flat. The automakers design their vehicles for maximum space and efficiency, and many decide to use compact spare tires. Compact spares take far less room than full-sized tires. Stoney Creek drivers understand the benefits of space saving spares. They know that compact spares do not ride like full-sized tires. When using compact spares, drivers must reduce speeds and try to limit the distance traveled. Compact spares can get the vehicle safely to a repair facility or home. At Betterway Sales & Leasing, we want every driver to operate safely with a good set of tires. Automakers do not intend compact spares for long-term usage, and full-sized spares work well but also require replacement. Call us when you need to repair or replace a tire. We offer high-quality tires to meet your manufacturer's requirements. Please call or stop by today.